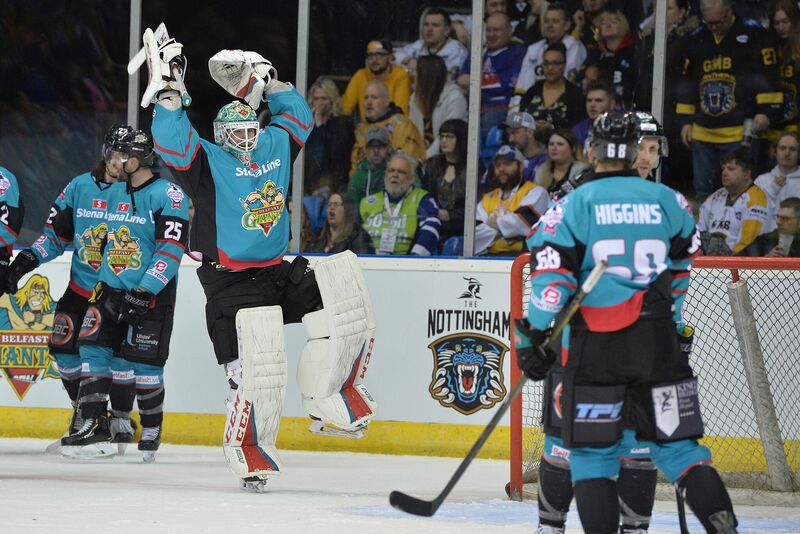 The Belfast Giants arrive in Nottingham for 2018/19’s Playoff Finals Weekend with three of four available domestic trophies. 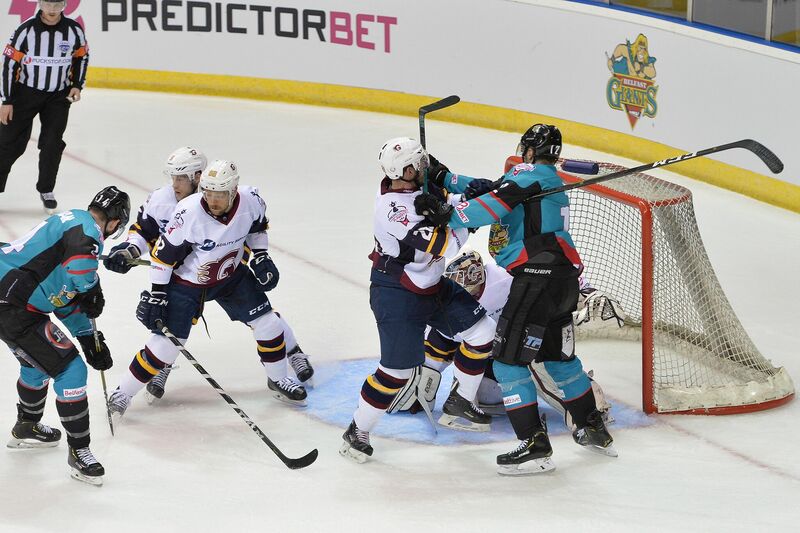 After disposing of the Coventry Blaze in emphatic fashion, Adam Keefe’s men faced a Challenge Cup Final rematch against the side who took them to overtime, the league’s new boys, the Guildford Flames. The Giants were once again without David Rutherford- yet to feature at all in these playoffs. The game got off to an energetic start, both sides rolling lines without a single whistle until 5.17 into the first period. Belfast provided the lion’s share of chances- most notably when Dustin Johner fanned on a cross ice pass from mid slot. Travis Fullerton made a beautiful sprawling glove save nearing the ten minute mark, after Chris Higgins connected with a layup from behind the net. Guildford applied more pressure immediately following this, calling Tyler Beskorowany into his first meaningful action of the night. Guildford were virtually guaranteed a 1-0 lead as the period entered its final 3 minutes, when Tyler Beskorowany parried a shot out towards his own back door- the crashing Guildford jersey pulled the trigger but had his stick lifted in the nick of time by one Chris Higgins. AVFTB’s Davy McGimpsey, located immediately to my left in the press box, lamented Belfast’s low faceoff win percentage in a tense first period which Belfast comfortably dominated. However neither side could crack the goose egg as the clock wound down. The second period began much as the first had ended- cagey end to end hockey with predominantly low percentage chances. Tyler Beskorowany pulled off a clutch save to deny a second from Guildford as a fast middle period entered its last minute. A resulting turnover from Paddy Dwyer was thankfully sent wide as the Flames swarmed and Belfast struggled to get a foothold. The pressure on Beskorowny continued into the final seconds, producing a stunning double save. However, his defensive lines were not so clinical. A disjointed Giants headed to their room looking for a way back into a tight game. 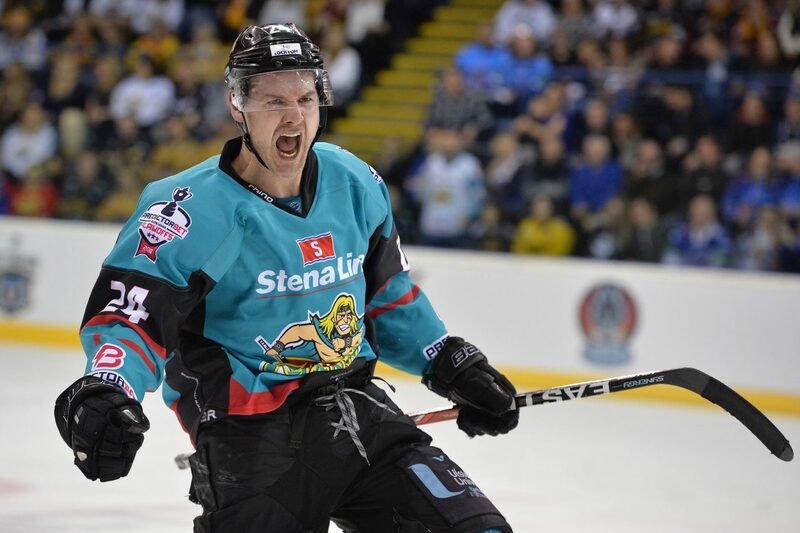 The Belfast Giants certainly looked like they had more jump as an all or nothing third period got underway, but a so-far free flowing and penalty-free game meant their time to affect the scoreline was limited. It wasn’t smooth sailing to close the game though- as the Giants endured a desperate penalty kill in front of Tyler Beskorowany- coming close to scoring on the open net, but ultimately holding out to take the win. A Playoff Finals place booked. A chance at history.